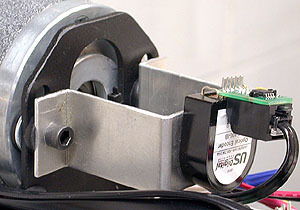 On the APQS machines the needle position sensor can be found under the top cover, mounted on the secondary shaft of the motor. Turn the handwheel to the right direction until the point of the needle just touches the fabric on its way down. Loosen up the nut holding the sensor to the bracket. Turn the body of the sensor very slowly watching the green light above the DOWN button. If the light just flashes, turn the body of the sensor backward until the light is on again. With fine adjustments of the sensor the green light can be constantly turned on. When the green light stays on the sensor is aligned properly. Tighten the sensor mounting nut. When adjusting the "up" position, the take-up lever should be above the lower green mark to release the thread from the hook. When adjusting the "down" position, the needle should stop at its lowest position. The needle should return to the top position with the take-up lever between the green marks, closer to the lower mark.